This is an amazing oil containing antiseptic properties and a sweet fragrance, I use it regularly to stay away from diseases and smell good. Sports Massage Blend is especially developed for all types of sportsmen including athletes for use before or after the exercises. The blend has deep penetrating effect that helps in relaxing the muscles as well as increasing fluid circulation in body. 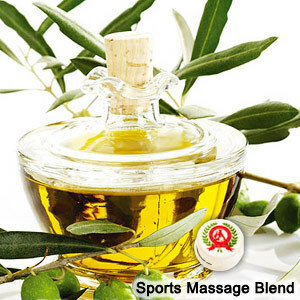 Further, Sports Massage Blend can also be used for loosening the stiff as well as tense muscles. It also contains detoxing Juniperberry, circulation stimulating Rosemary and warming Black Pepper that makes it perfect for athletes & sports active people. Juniperus communis (Juniperberry), Vitis vinifera (Grapeseed), Rosmarinus officianlis (Rosemary), Tocopherol, Piper nigrum (Black Pepper), Limonene, Linalool, Geraniol. A blend made from selection of pure essential oil on non-allergic oil base, the rich content of this essential oil provides a deep therapeutic effect without arising any skin irritation. Every batch of massage oil is carefully hand blended for ensuring better quality and effectiveness in the involved body therapy based applications. Further, it is developed for easy application thus providing rejuvenation as well as body benefits to compliment massage technique.